Super Bright LEDs released a line of LED step lights. 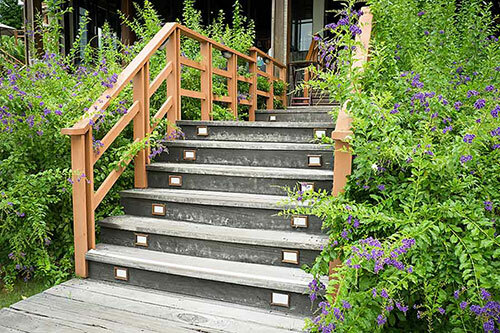 The customizable lights are designed for accent lighting or to add safety illumination to deck steps, stairways, hallways and pathways. Available in a variety of lens and faceplate options, this line can be installed in round or rectangular recessed and surface­ mounted junction boxes. It includes a 12-v AC/DC or 100-­240-v AC operation. The lights are available with a frosted glass lens for natural white illumination or a lightly etched lens for higher light output. Additionally, the louvered faceplate option reduces glare and provides a softer, downward-­focused look, while the open faceplate allows for maximum light output. Finish options include bronze, white and copper. Durable polycarbonate housings protect internal components, and rubber gaskets are included to seal out water. The energy-­efficient lights are designed to last up to 30,000 hours, and a three-­year warranty protects against any defects or malfunctions.